On May 7, 2012, Seattle International Film Festival’s year-long program presented a one-night-only showing of the Bolshoi Ballet’s The Bright Stream by Alexei Ratmansky. This live taping was held April 29, 2012, and featured backstage footage, views of the reconstructed Bolshoi Theatre, and an interview with one of the programming directors. 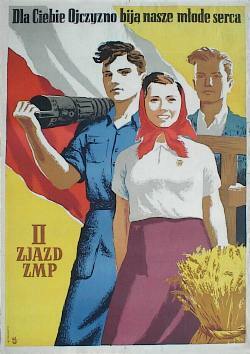 The 1935 original was banned in Stalin’s Russia, but not for the reasons one might expect. It wasn’t banned for the cross-dressing men and women. It wasn’t banned for the adulterous couples. It wasn’t even banned for unpatriotic music. It was banned because the choreographer had put classical movement on common people, portraying the hero of labor as elegant and refined. 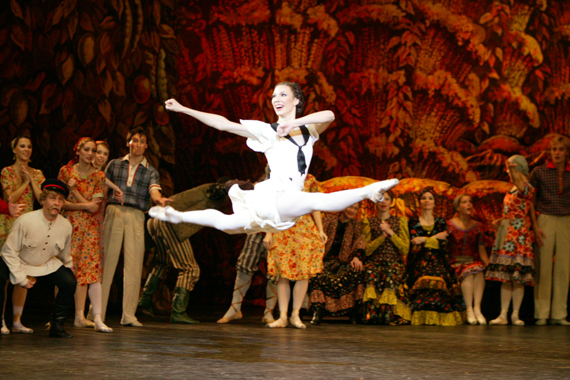 The 2003 version of The Bright Stream follows the same libretto as the 1935 original, but the ballet is sprinkled with parallel feet, floor work, and neo-classical lines. Ratmansky has created a world in which the mustached proletariat reigns supreme, where socialist morals prevail over regressive indulgences. And it works. What would be seen as another work of Socialist Realism in the 1930s and 40s is now a humorous look through the rose-tinted glasses of Communism. Maria Alexandrova is picture perfect as the Ballerina. Her elegance, poise, and bit of snobbery play well against Svetlana Lunkina’s gawky, slumped shouldered yet persevering Zina. Mikhail Lobukhin performs a likeable, only slightly lecherous husband, Pyotr, who makes the correct moral choice in the end—staying with his hardworking wife instead of leaving with the free-spirited Ballerina. The most exciting work came from Corps de Ballet member Xenia Pchelkina as the innocent school girl and First Soloist Denis Savin as the accordion player. Pchelkina is the perfect young revolutionary—eager, wide-eyed, and malleable. Savin is sleek and exotic in his portrayal of the capital musician. During intermission, Savin can be seen backstage practicing his upcoming solo; his rehearsal is sinuous and mesmerizing, the real performance is simply magnificent. Another standout performance was that of Ruslan Skvortsov as the Ballet Dancer. Portraying a strong specimen of masculinity in Act I, Skvortsov surprises with his well-executed pointe work and Romantic era affects in Act II. His subtlety and comedic timing add volumes to Ratmansky’s light poke at old customs. As the Ballet Dancer and his companions play tricksters, his hairy-chested ballerina never once edges on campy. Skvortsov is a true Sylph. A discussion of The Bright Steam cannot be had without mentioning the music. One of only five ballets written by Dmitri Shostakovich, the work, originally named “The Limpid Stream,” was accepted by the public and press as “democratic.” The ballet as a whole, sadly, fell from grace, and it was years before Shostakovich wrote another ballet. The score has it all: beautiful adagios, bombastic marches, and playful allegros. The diversity is surprising since Socialist Realism called for only simple, pleasing, harmonic melodies. A clip from this taping of The Bright Stream can be seen at http://www.youtube.com/watch?v=iiP_drriQWE, as can clips from the ABT version. The Bolshoi presents most of its season live through Pathe Live. To find out more about viewing dance from around the world on the big screen, visit http://www.pathelive.com/. As of now, most performances can only be seen outside of the US; however, like The Bright Stream, they do come to the states…and better late than never.